We have just released new production machines and equipment. NEWBILT offers the complete chain of production equipment and services for vinyl record production. We offer a complete range of services throughout the vinyl record production cycle. From factory planning and training up to refurbishing of your used equipment. NEWBILT Machinery develops and builds new vinyl record pressing equipment. 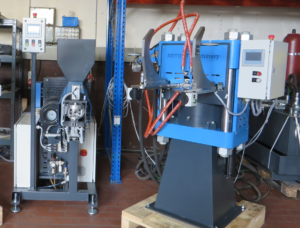 Based on many years of experience in production, engineering and vinyl record manufacturing, we started by developing a semi-automatic vinyl record press and vinyl extruder. Ongoing growth of markets led to the decision to further invest and develop a fully automated record press. Based on the semi-automatic press, the stand alone extruder and the all automatic press our portfolio covers the full range of vinyl record production equipment. Production support is provided from the initial planning of an entire factory from scratch to introducing you to our carefully chosen network of professionals and companies.